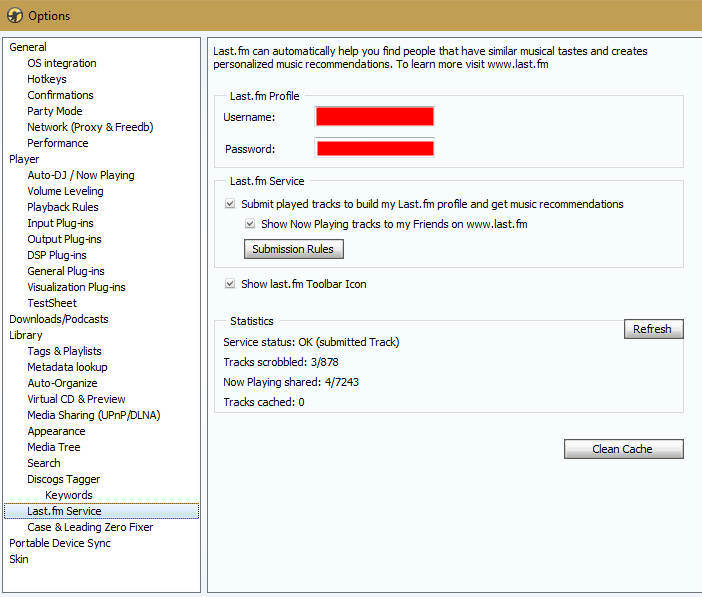 Create call for Last.fm to import whole MMW history was tried when I was creating the plugin, but problem is that Last.FM blocks any scrobbles in past if newer exist, also they flag as spam many pass scrobbles at time, so such feature is omitted from plugin due the Last.FM design. I have 139646 playcounts in MMW over past 16 years and would certainly like to have them all passed to Last.fm, but unfortunately without ability to do so. I want to ask if there are any extension tools that can sync my entire play history to Last.FM? Or sync from a date range? I've been using MediaMonkey for a while now. Now I want it to sync my entire play history with my new last.fm account. I know it's possible because I notice that I can set the last.fm scrobbler extension to cache mode for offline and it would sync later when I'm connected. So theorically, it could populate the LastFM_Cache.dat file with all my old play history and then sync it to last.fm. Please let me know if there are tool to sync my play history. Thanks! ~groan~ Now I can't reply to your PM's?!?!?! I've tried twice and they're just sitting in my Outbox. MediaMonkey is installed on my work laptop. I have local admin access but I'm not sure whether I'll be able to contact you via this corporate version of Skype. Skype for Business needs your contact in the format someone@domain.com. Where do I find the log file? I can see the cache here. I'm not scrobbling (never have) from any other apps on this PC. What does Log File say? For Me it works. Is it possible that you have multiple apps Scrobble? Are you able to send me some suggestions? Scrobbling still doesn't work. Sent a reply in PM. Basically just looking for a good suggested time window, given that you and I are on opposite sides of the globe. Failing that, written instructions on how to further troubleshoot? I've tried to reply to your PM, for some reason it's just sitting in my Outbox along with one I tried to send many years ago to someone else :-? Analyzing logs and status, looks like Plugin was just initialized not set to scrobble or is excluding tracks. Sent you PM with more details. When you go to Tools -> Options -> Last.fm Service What is the state of your service status? Note that I use 1.1.0.41 Version. Here is what I see when I just tested mine. No Now playing or now scrobbling notifications on LastFM. Just not showing at all. Does last.fm also fail to show Now Playing? Sorry for the slow response. Life got n the way. My PC time is correct, locally Australian Eastern Standard Time. Last FM credentials are confirmed as correct and the icon on the toolbar is green. Green for Go I assume. I have renamed my c:\Users\haypau\AppData\Roaming\MediaMonkey\LastFM_Cache.dat file forcing the creation of a new one. The played tracks are still being cached and not being scrobbled. Any other ideas? It's driving me nuts. Rename cached file and try to scrobble. Last.fm usually do not allow to have two tracks scrobble at same time from multiple devices and that could be culprit.